Recognizing that student talent and interest in Black performance styles could foster the development of ensembles as a vital part of academic coursework, Herman C. Hudson, with the assistance of Executive Director Lillian Dunlap, established the IU Soul Revue in 1971. Demonstrating a repertoire based in R&B, soul, and other forms of urban Black popular music, the "Revue" would become America’s first collegiate Black popular music ensemble offered for academic credit. 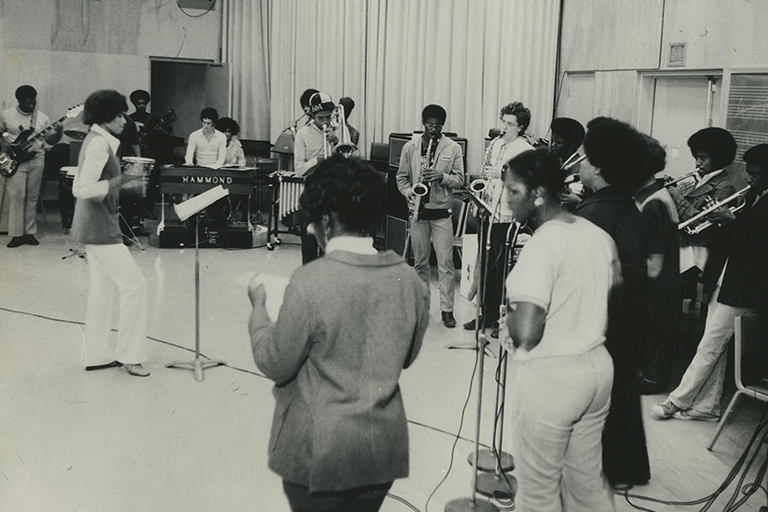 Portia K. Maultsby, first director of the IU Soul Revue, leads rehearsal in 1971. In 1974, the African American Dance Company was established as a credit-bearing course focused on Black dance. That same year, the African American Arts Institute was established to provide a mechanism for ensemble performance management and engagement in creative and research projects. One year later in 1975, the African American Choral Ensemble was established to provide students with the opportunity to study and perform various forms of choral music that evolved out of the Black experience. These three ensembles have become integral components of the African American Arts Institute, while they also are offered as courses through the Department of African American and Africa Diaspora Studies. Iris Rosa (center), first director of African American Dance Company, with students in 1975. 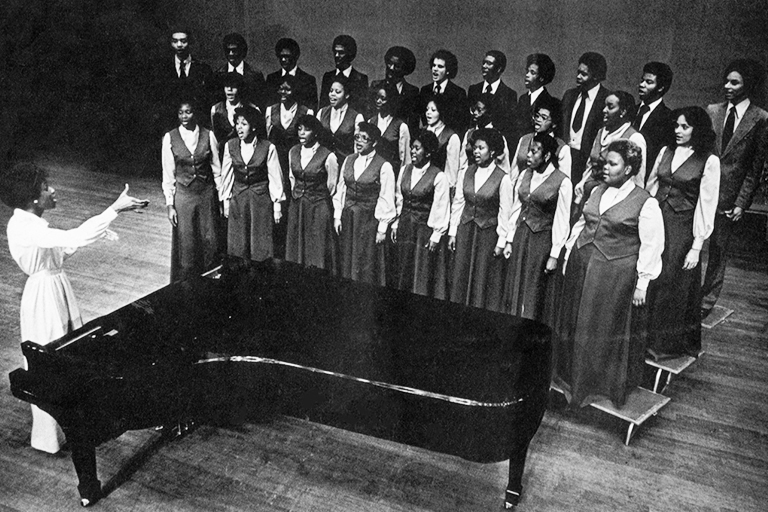 African American Choral Ensemble, directed by Mellonee Burnim, during 1970s. Under the leadership of outstanding artistic directors, the ensembles have provided hundreds of students with invaluable educational experiences over the years, while also providing those students with a sense of connection to IU. The Soul Revue was built and sustained under the leadership of Portia K. Maultsby, James Mumford, Kenneth Ware, Michael Woods, William Banfield, Coleridge Taylor-Perkinson, Johnny Griffith, Nathanael Fareed Mahluli, Tyron Cooper, Crystal Taliefero, and current director James Strong. Iris Rosa served as the African American Dance Company’s director for 43 years, from 1974 until her retirement in 2017. Stafford Berry currently directs the Dance Company. Michael Gordon served as director and Mellonee Burnim as assistant director of the Choral Ensemble in its first year. And the ensemble was further developed under the directorships of Mellonee Burnim, John Williams, James Mumford, Keith McCutchen, and current director Raymond Wise.